BERNKASTELER LAY GOLD KAPSULE BABY!!!!! This wine may prove immortal --- something you could pass down as a family heirloom... or hell, pop it the day it arrives! Either way you roll on this one, you WILL NOT be disappointed. Since 1156 the Prums have called the village of Wehlen home. The Prüm estate as we know it today began with Sebastian Alois Prum (1794-1871); his brother Jodocus constructed the Wehlener and Zeltinger sundials. Of his six sons only Mathias (1835-1890) married. In 1911 the estate was split amongst Mathias’s four sons and three daughters. It was when his oldest son, Joh. Jos. Prum, started the estate and his son who really propelled the estate into international stardom. It’s most important vineyard holdings are the Wehlener Sonnenuhr, Graacher Himmelreich, Zeltinger Sonnenuhr and Bernkasteler Badstube. 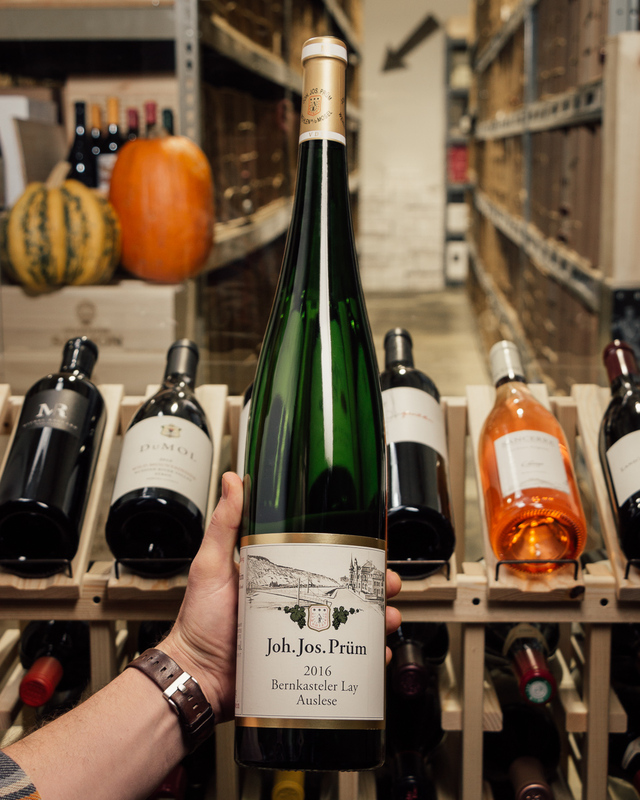 Today, J.J. Prum stands as one of the most revered producers of Riesling in the world. This is just beginning to give its best, but it will be even more exciting from 2019! Enormous energy and more than enough richness. The finish turbocharged, so hang onto your hat! Drink or hold. Served from the 375-milliliter bottle, the 2016 Bernkasteler Lay Auslese (Gold Capsule) displays a discreet bouquet that needs its time to open up. It's pretty reductive at this early stage (March 2018). The attack on the palate is racy and fresh, and the wine is filigreed and precise, very clear and fresh in the well-structured finish. This (AP 05 17) is a lovely Auslese version that is on par with the bright, light and filigreed Badstube Kabinett. It's a delicious Riesling bottled at 7.5% alcohol.